Today, even the family pet can receive a Valentine’s card, with or without a bow-drawing cherub on the front! Whether you’re happily single, in a committed relationship or looking for love, Valentine’s Day isn’t just about giving a red, red rose; holiday accommodation providers promote heart-shaped chocs, satin sheets and a chilled bottle of bubbly for the entire month of February. So there’s no excuse, folks – time to book that glamping trip today! While the card shops and florists will be festooned with fabulous cards and flowers, have you ever wondered how it all started? Research suggests there are numerous Christian martyrs named Valentine; one story describes that Saint Valentine was a priest of Rome who was imprisoned for sheltering Christians, who were being persecuted at the time. And it is thought the first written association of ‘love’ with Valentine’s Day was scribed by none other than Geoffrey Chaucer in 1382, in which the writer noted ‘how every bird chooses his mate’ around the middle of February. In the mid-18th century, it was popular to pass love notes made of lace and paper, while in 1847 (the year Charlotte Bronte’s romantic novel, Jane Eyre, was published) Esther Howland of Worcester, Massachusetts starting producing Valentine cards. Of course, today it is a hugely commercial venture, with a staggering £1.9bn being spent in the UK alone on cards and gifts (2015 figures). This may amaze or annoy you, yet even if you’re not romantically inclined, it’s a chance to have some quality time with the one you love or enjoy some quality ‘solo’ time. Just think: Christmas and New Year are a distant memory; spring is still a good six weeks away. It’s just the right time for a treat as the days start to get a bit lighter, and the snowdrops make their first shy appearance. So this is where glamping can really come into it’s own. How about a Shepherd’s Hut, or Safari Tent or a Wigwam®? 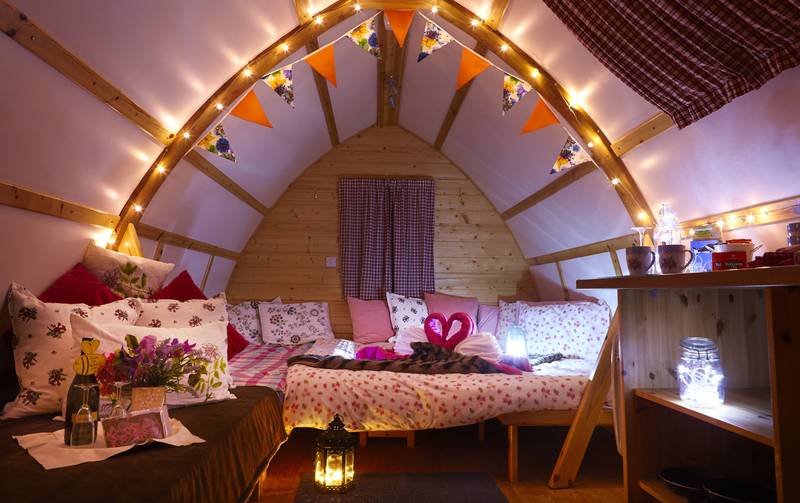 Wigwams® are heated, secure timber cabins, spacious yet inviting for a romantic weekend away. A great holiday in the great outdoors, many Wigwam® sites also offer twinkly fairy lights and cool bunting to make your stay even more memorable. Of course, you could also go abroad, as Valentine is also celebrated across the globe in China, Latin America, and Lebanon. Yet there’s so much choice here in the UK, why even start searching for the passports? Stay in the UK, and get that loving feeling!